Today’s roundup features 15 free crochet patterns for granny squares (or blankets made with granny squares) in one of my favorite yarns, Lion Brand Heartland! Children’s Pocket Scarves, Oceanic Chevron Pillow, and Throwback Throw, available digitally in ILikeCrochet magazine. 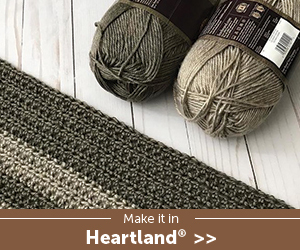 Heartland is a soft, heathered acrylic yarn that’s made in the United States and comes in a great range of colors inspired by natural landmarks. It’s one of the yarns that several charities I’ve featured in my monthly charity spotlight include on their lists of approved yarns because of its softness combined with easy care instructions. This post is part of Granny Square Month, a 30-day celebration of granny squares. You can find more information, and links to the other posts, here. All images are copyright the respective designer or publisher and are used with permission.